Sunday September 3rd 1893 We got the morning work done and Will went over to Woolfs. Laura and I wen to church and took dinner at the St James. We went over home in the afternoon. I got supper after we came home. Spent the evening at home. Monday September 4th 1893 Will helped me with washing and went to the valley. he found the gray mare lame and had a hard time getting her home. I was busy about the work all forenoon and worked all afternoon and evening on sweet apples Will brought me. Laura went over the river with Edith to stay all night. 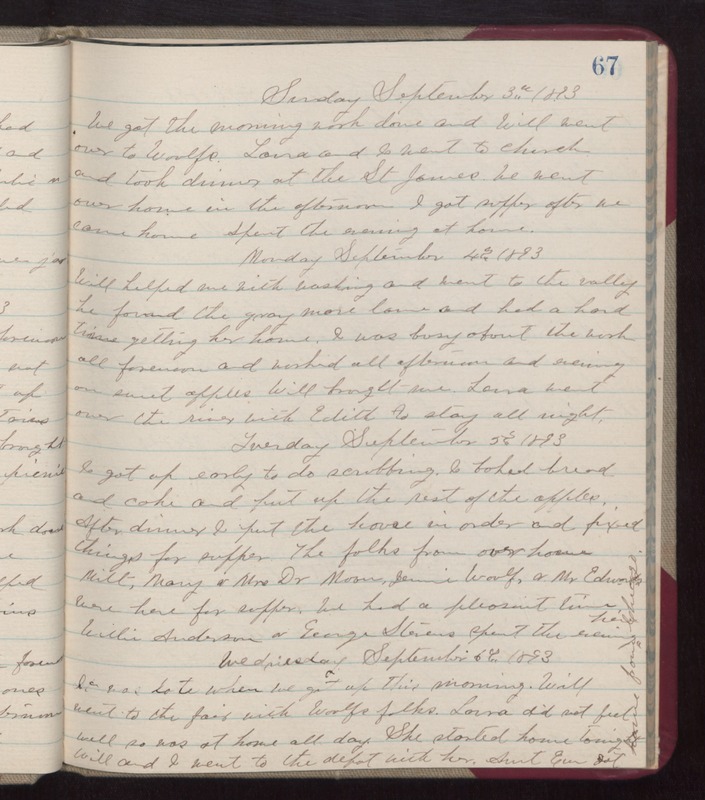 Tuesday September 5th 1893 I got up early to do scrubbing. I baked bread and cake and put up the rest of the apples. After dinner I put the house in order and fixed things for supper. The folks from over home Milt, Mary & Mrs Dr Moon, Jennie Woolf, & Mr Edwards were here for supper. We had a pleasant time. Willie Anderson & George Stevens spent the evening here. Wednesday September 6th 1893 It was late when we got up this morning. Will went to the fair with Woolfs folks. Laura did not feel well so was at home all day. She started home tonight. Will and I went to the depot with her. Aunt Em got home from Chicago.